The expected in-stock date is 07 May 2019. JBL EVEREST™ 710GA is rated 3.8 out of 5 by 4. Rated 4 out of 5 by Fix your descriptions from Nice set of headphones. The first set I got were poorly packaged and were damaged when I got them. JBL was easy to deal with and sent me a replacement pair. These headphones are pretty good. They have more of a flat audio profile then anything else which means they'll work for a wide variety of music. The only down side to these is the earcups could have a better seal around my ears. However even with the sealing issue the overall clarity and bass is pretty impressive and seems to be improving as the drivers break in. The build quality is also pretty nice with good quality plastics being used and also a metal head band and metal hinges. Even the hard case and included cables are nice. The buttons are somewhat easy to find and use, blue tooth pairing is very fast and also the BT lag is minimal with these. I can't speak yet for battery life but if its anything like my E65BTNC headphones they'll last forever on a charge. If I could improve these in anyway it would be to allow for more movement of the ear cups as it seems to be limited unlike the T500BT headphones which use a more traditional design. Rated 3 out of 5 by jloui12 from Above Average I really enjoyed these headphones, but it didn't live up to my expectations. I have a JBL Flip 3, and a 4, and the sound is amazing, and it was rather cheap. This product, being $250, seems a bit high. Heres why, First, the bulkiness. These headphones are just plain bulky. Which sticks out and looks like a pilots head set. Secondly, the sound was very good, but to me didn't live up to the JBL standards. They lack in rich, deep bass, which is what I truly look for, and anything on the last 2 volume clicks will make a plastic rumbling noise, and static out the song. But other than that, they were super comfortable, and lightweight. They also fit over the ear perfect, instead of on top. Are these headphones water/sweat proof? The JBL Everest 710GA is not waterproof nor sweatproof. This will probably be a no... 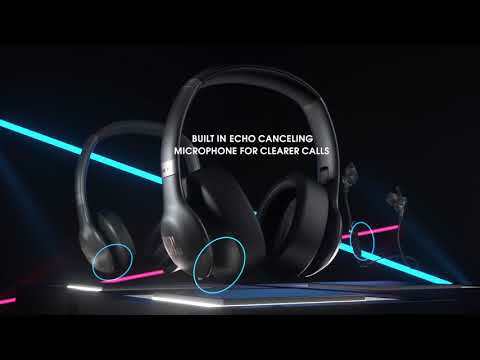 But can I connect these headphones to my wifi and run them independent of my phone when using spotify like I do my other wireless speakers powered by Google assistant in my house? Hi! Apparently, the Everest 710GA is not capable to connect to the WiFi network to work independently. Is this Headphones are Vegan-Friendly? Hi, Thank you for your question. All of our headphones are using protein leather (not real leather) and therefore are vegan-friendly. I hope this answer your question.